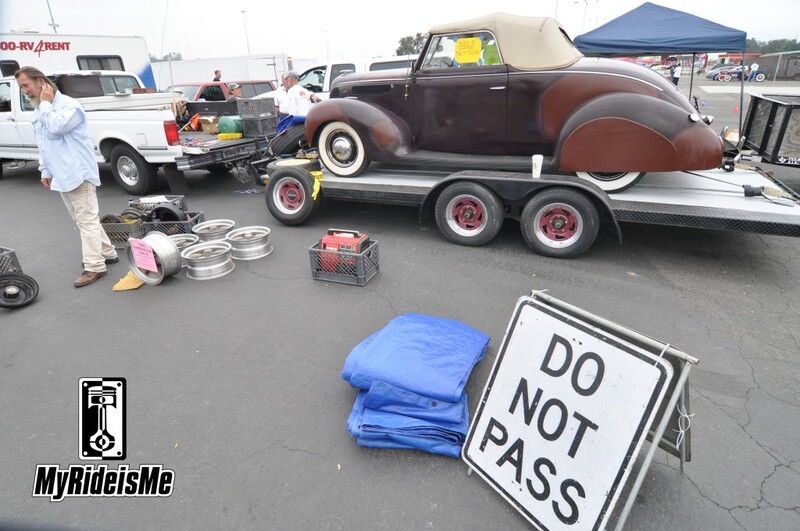 Friday of the LA Roadster Show means swap’n. This year is no exception with cars lined up fer-days waiting to get in and grab the primo swap spots. Just so you know, the gates don’t open until 5AM to park and wait for the other, main gates to open at about 10AM (sometimes sooner). Once inside, there’s no telling what you might find. Here’s my look around with my Pops enjoying the cooler California weather. 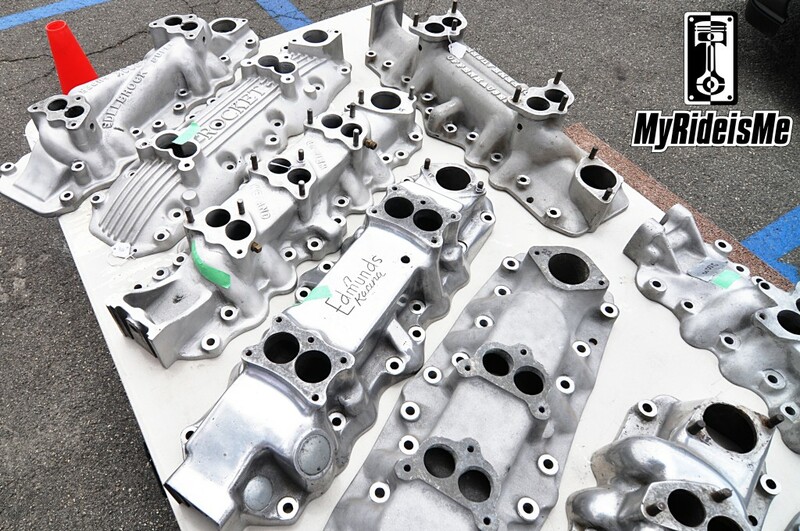 The first thing you’ll find at the LA Roadster Show is problably the most obvious. Like the nasty Hemi powered hot rod above with a severely cool rivet covered interior. 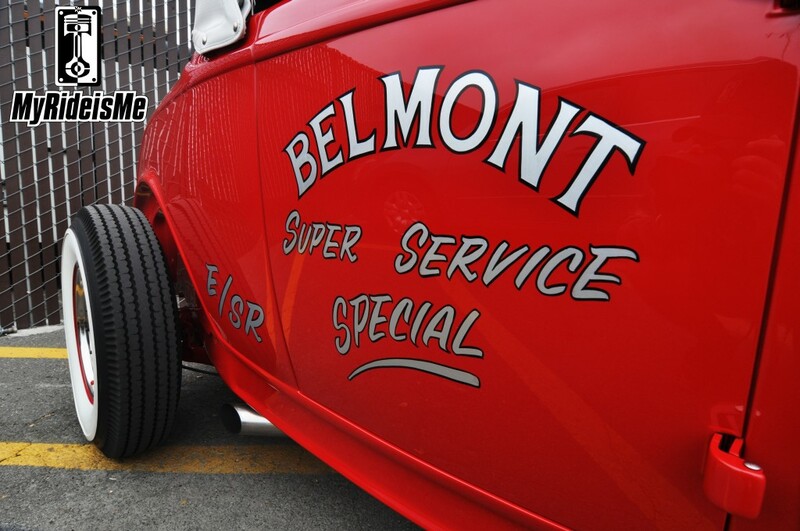 If he could make the electric fuel injector setup disappear, this car would be even more of a show stopper… But there were other great rides to find, even when the focus of the day was setup. 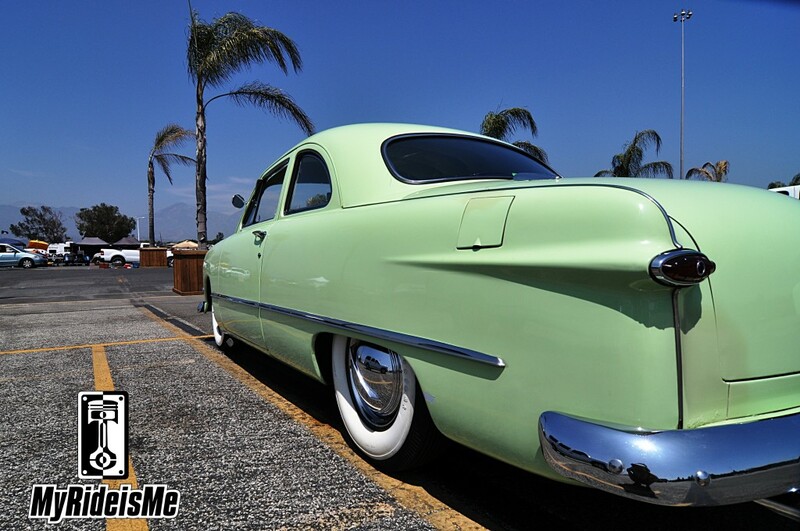 This 1950 Ford was enjoying some quite time on Friday before the big car show starts. I couldn’t resist catching the the brought-in palm trees to attempt the full Cali look. 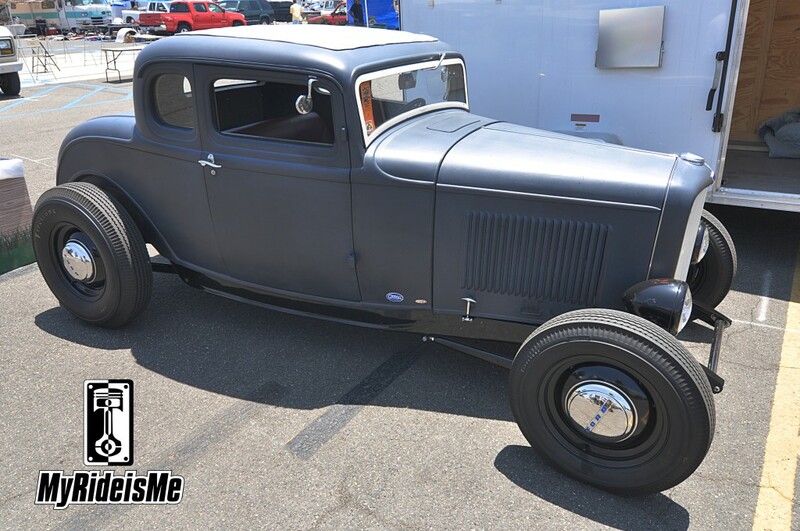 This simple but elegant deuce hot rod oozed cool. Nothing is overstated and I guess that’s why I had to shoot it. Down and dirty, but wash-n-wear hot rod! 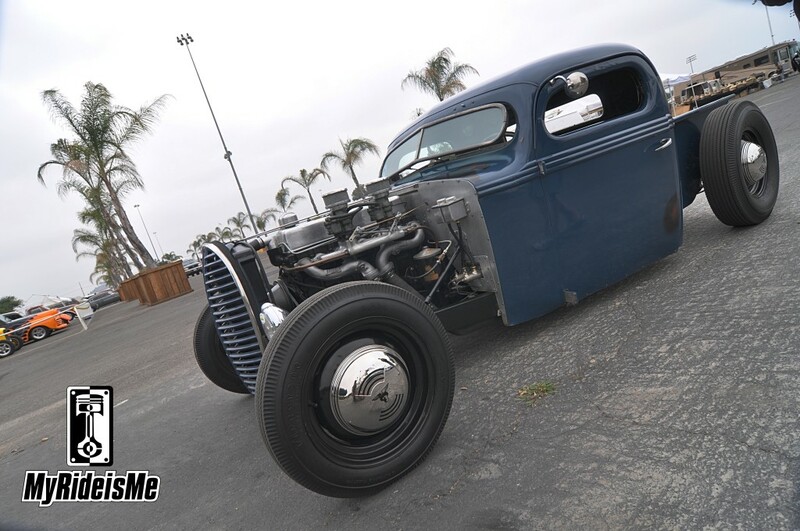 Keeping the cool California hot rod theme running, who can resist this inline six powered pickup? 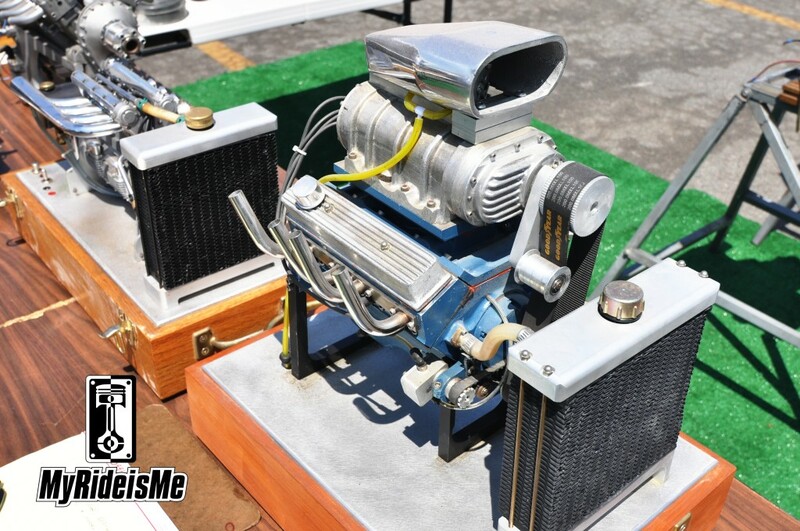 Arriving at a swap meet, hot rodders fill their heads with all the great deals they’ll find and how there’ll be so many great parts, INSIDE, it’ll be rough to even choose what to buy! Well, the best stuff doesn’t even make it inside. My buddy Rob sold a 3/4 sprint car he bought just this week IN LINE waiting to get to his swap space! When you come to LA Roadster Show, don’t hesitate. There are buyers from all over the world and they know what they’re looking for and bring cash! This baby also had a sold sticker before it even got inside. Don’t-cha want to hear this run! 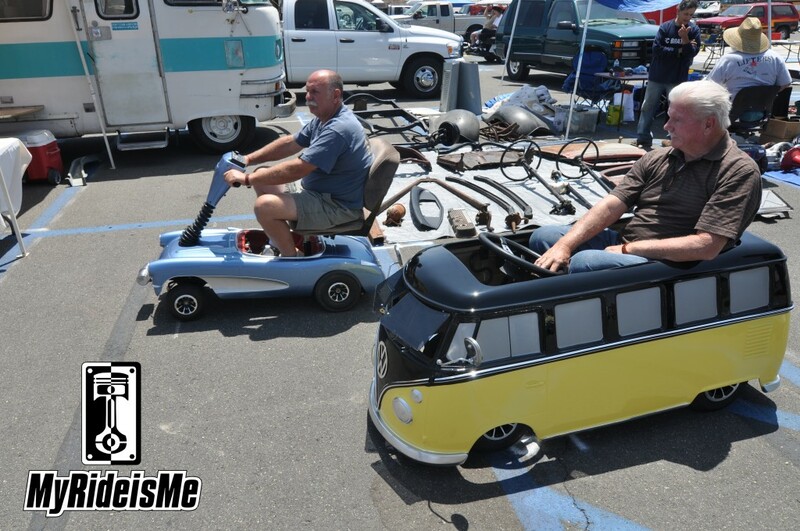 These guys were having a blast saving their feet for Saturday by riding in these electric powered rigs. The VW is well done rolling-cool, but the gasser corvette’s my choice. Finally, don’t think I’ll hit this show without showing it’s best pinstriping. Love this vintage styled lettering. Stay tuned! There’s tons more pictures and coverage coming! 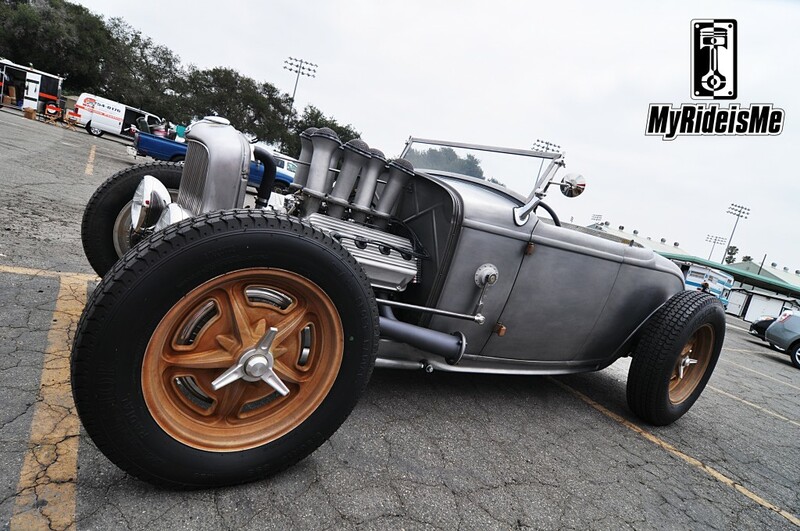 Want to see more of the LA Roadster Show? 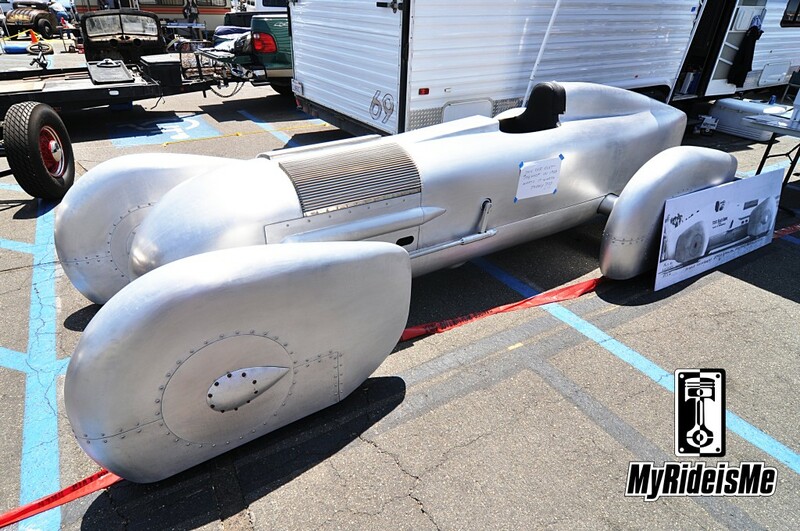 Go here: LA Roadster Show pictures. 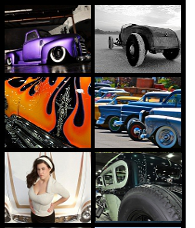 Or, to finalize your plans for Pomona, please check this: Learn the NEW LA Roadster Show layout and enjoy our recommendations. thanks for taking a few snaps/i couldn’t make it! (i’ll try next year) got a ”30 ” i gotta build/need a few items;like almost everything! lotsa new shows and nerw places cropping up! the hobbys growing!